This allows you to collect or send email via a normal web browser. Ideal for occasional use it enables you to easily send or recieve email from your account from most computers that are connected to the internet. For example you could check your email whilst out of the office (ie at another company, as long as they don't mind!) or even whilst on holiday (internet cafe). It can also be useful if you are sent a big attachment and need to delete it without waiting to download it. Collection by an email program is unaffected so you can still use for example Outlook/Outlook express etc along side it. 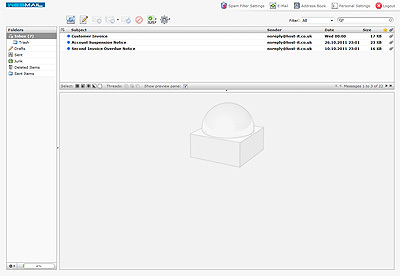 All but the basic hosting packages can be enabled for web mail. To bookmark your host-it web mail login link, first visit the web mail login page https://webmail.host-it.co.uk/ and click the add to favourites option on your browser, usually in the shape of a star. Most browsers also support the keyboard shortcut of Ctrl+D.